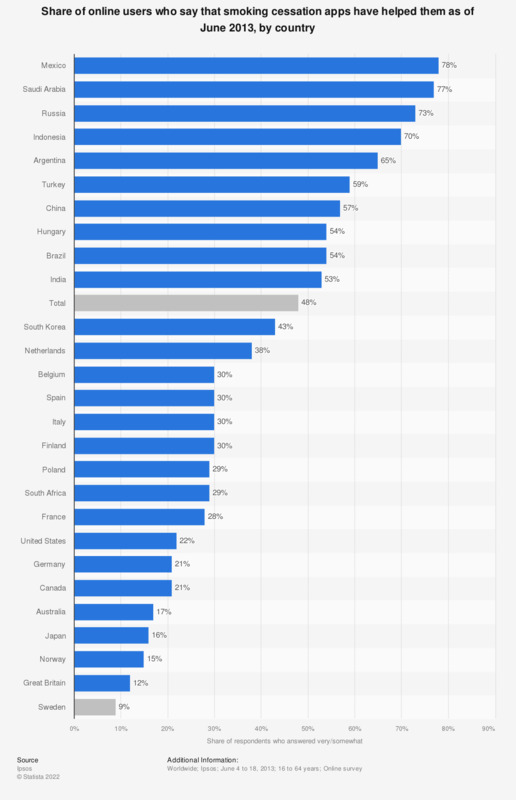 This statistic gives information on the share of online users who were likely to say that smoking cessation apps have helped them with their smoking habits as of June 2013, by country. Overall, approximately half of respondents had a positive experience with smoking cessation apps. Online respondents in Mexico had the highest rate of success with smoking cessation apps as 78 percent replied in a positive way. In the United States, 22 percent of respondents felt that smoking cessation apps were helpful. For the results of the survey presented herein, an international sample of 3,382 adults aged 18-64 in the US and Canada, and age 16-64 in all other countries, were interviewed. Approximately 1000+ individuals participated on a country by country basis via the Ipsos Online Panel with the exception of Argentina, Belgium, Hungary, Indonesia, Mexico, Norway, Poland, Russia, Saudi Arabia, South Africa, South Korea, Sweden and Turkey, where each have a sample approximately 500+.